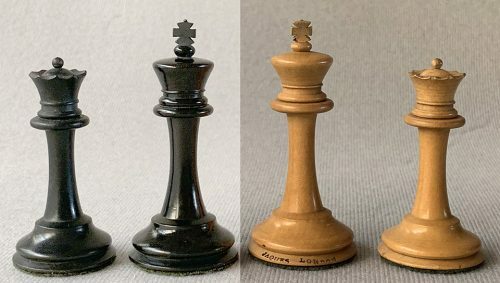 Jaques Anderssen Library Size Chessmen. A set of antique Jaques Anderssen Library Size Chessmen, circa 1862. 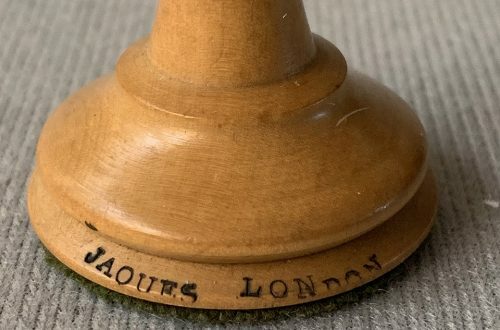 This style was produced by Jaques between 1856 and 1864. 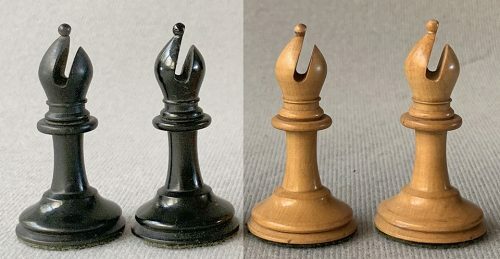 The chessmen are Boxwood and Ebony, unweighted and rest atop their original green baize base pads. The King stands 2-7/8″ tall. The Knights are of the Anderssen style. The White King is stamped “Jaques London ” on the rim of the base and the Kingside Rooks and Knights are stamped with a King’s crown on their summits. This King height is often referred to as the “Library Size.” The Jaques Anderssen Library size chessmen are housed in their original Mahogany slide-top box with the original green Jaques makers label. 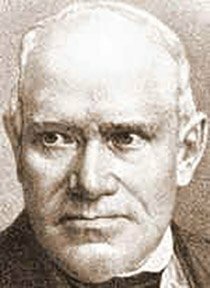 According to the Camaratta Index of Labels, this is the earliest of the 1862 label styles. 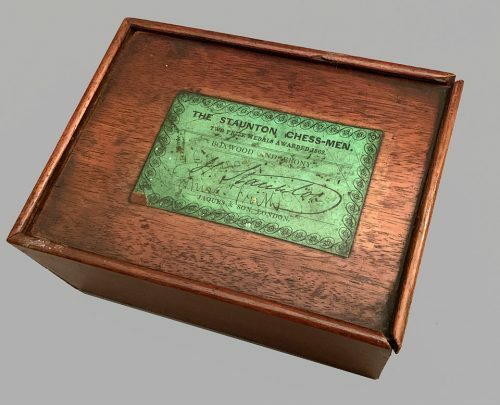 The chessmen, box and label are in excellent condition. 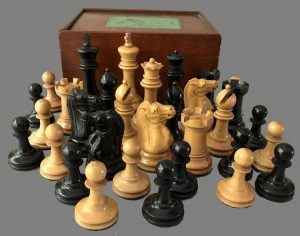 These chess pieces play and display best on a chessboard with 1-7/8″ or 2-0″ squares. The antique chessboard and Tanner Chess Timer shown is not included in the sale. 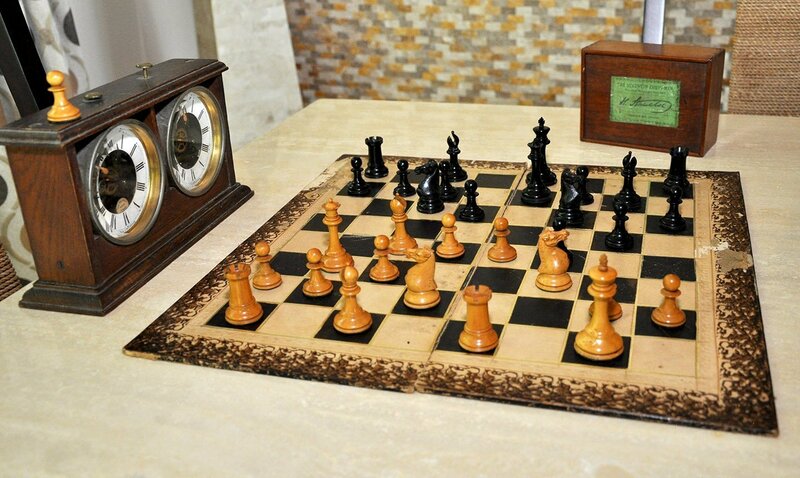 For a complete selection of our finest new and antique chessboards, click here. 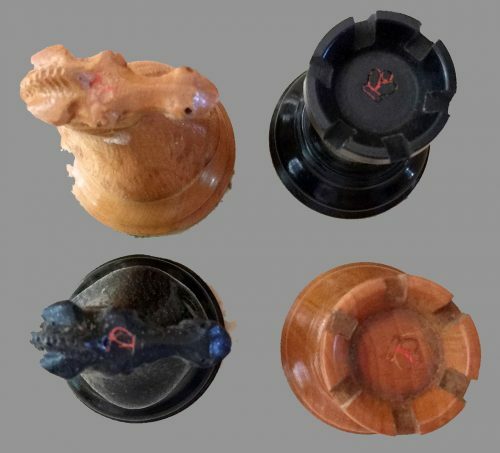 For our extensive selection of contemporary and antique chess timers, please click here.